I got the perfect app for the upcoming holiday season for families to enjoy their favorite holiday classics with ease! Movies Anywhere lets users connect their iTunes, Amazon Video, Google Play, Microsoft, FandangoNow and Vudu accounts to keep their entire digital movie library in one place. You no longer have to switch between different apps and accounts to find the movie you want to see! I have had this app for a while and LOVE it!!! With the holidays being so hectic - family dinners, traveling, and gift shopping - this is the perfect app to help families get through them. Whether the kids need entertainment when road tripping to grandma's, then picking the movie back up when they arrive at their destination, Movies Anywhere makes the transition to keep watching the film at the same point they left off seamless and possible! With five major major studios putting their catalog of films on the platform - Sony Pictures, The Walt Disney Studios (including Disney, Pixar, Marvel, and Lucasfilm), 20th Century Fox Film, Universal Pictures, and Warner Bros. Holiday favorites range from Miracle on 34th Street, How The Grinch Stole Christmas, Elf, A Christmas Carol and more! 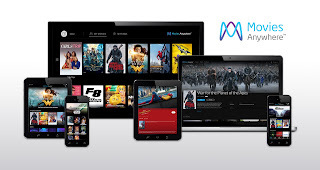 Movies Anywhere is available across all Amazon, Android, Google, Apple and Roku devices. Consumers can redeem digital codes found in eligible Blu-ray and DVD packages and enjoy them through the app as well.